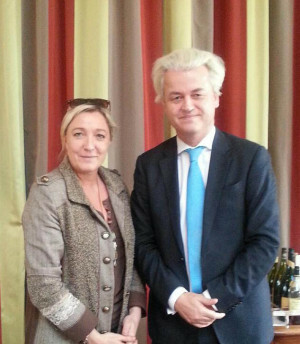 Wilders met FN president Marine Le Pen to discuss the plan in Paris last month. He also wants to draw in Belgium’s Vlaams Belang and other far right groups. The PVV is viciously racist, particularly targeting Muslims and immigrants. But its lash-up with the FN breaks new ground. The FN is a fascist organisation, whose founder and honorary president Jean-Marie Le Pen— Marine’s father—has described the Holocaust as a “mere detail” of history. Le Pen, who took a record 17.9 percent in last year’s French presidential election, aims to hide the FN’s fascism behind a slick public image. A tie-up with the populist PVV offers more mainstream credibility. The far right across Europe is in a state of flux, producing new formations, shifting alliances and a cross-fertilisation of ideas, as racist and fascist parties try to build in the climate of austerity. Wilders threatened, “Next year we can make an enormous advance.” Anti-fascists and anti-racists across Europe should be on their guard.